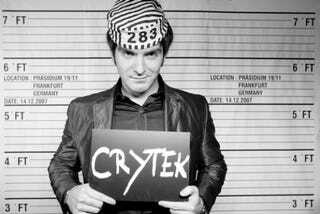 With titles like Far Cry and Crysis, developer Crytek is one of the biggest studios in Germany. That may change, though, because German interior ministers aim to outlaw the production of violent games. If this proposal passes, Crytek will be forced to leave its native Germany. Sixteen interior ministers met in early June to form a proposal that would ban the product and distribution of games "where the main part is to realistically play the killing of people or other cruel or un-human acts of violence against humans or manlike characters." The goal is to push through proposal into law by September of this year. "A ban on action games in Germany is concerning us because it is essentially like banning the German artists that create them," Crytek boss Cevat Yerli stated. "If the German creative community can't effectively participate in one of the most important cultural mediums of our future, we will be forced to relocate to other countries." A petition against this act has been signed by 64,000 Germans — something that will cause the government to officially review this game ban proposal. "The current political discussion will deprive German talent of its place on the global game development stage," explained Yerli, "and deprive German consumers of entertainment that is considered safe and fun around the world." Germany has traditionally had strict standards and regulation of what it considers excessively violent video games. Many Germans seem fed up with this attitude handed down from upon high as evident by a recent protest in the German city of Karlsruhe, which attracted an estimated 400 gamers.